Yesterday was one of those days when Ryan and I needed some motivation to go running. What motivates me the most when it comes to running? Eating cheeseburgers. My deal with Ryan was that we could try a new burger place IF, and only if, we ran at least 3 miles together. It's been a nice change of pace (haha I love puns) running outside instead of at the YMCA since the weather has been so fantastic lately. We finished our 3 mile run and showered and got ready for some dinner. We headed straight to the Burger Company, but were disappointed to see that they were only open for lunch on Mondays and were currently closed. 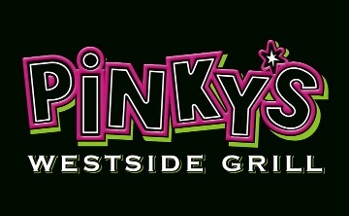 So after feeling pretty dejected, we looked across the street and saw Pinky's Westside Grill. After some minor cajoling I got Ryan to head over there. On the side we ordered some waffle fries. I chose Coca Cola classic to wash down my meal while Ryan stuck with a Dr. Brown's cream soda. The food was good. The service left much to be desired for. The bill came in at $20 before tip so our impetuous meal did not break the bank. All in all I'm glad that I ran those 3 miles for my cheeseburger. mmm breakfast sandwich and WINNER!